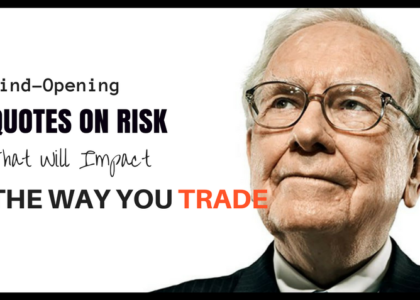 Risk management is more important than anything — this is one of those things that have spread on the Internet and, unbelievably, it has become an accepted truth to many traders. If you’re going through online brokers to do your stocks/forex trading, then a broker will often be able to advise you on good risk management. I don’t discount the role of risk management. It’s true, it is absolutely crucial! But as a person who likes to think deeper about things, I can only notice that the mind is the starting point of all things. It is all you really have in life; it is what you bring to the game. And risk management is only direct result of how you’re using it – or not using it. The trading/investment psychology work that I do here at Trading Composure isn’t about sharing some feel-good statements for some doe-eyed traders who lack mental toughness. It’s about helping one think with clarity. If one can’t think with clarity, how does one expect to manage risk? That was my point when I told the guy that trading psychology is the most important aspect of trading. 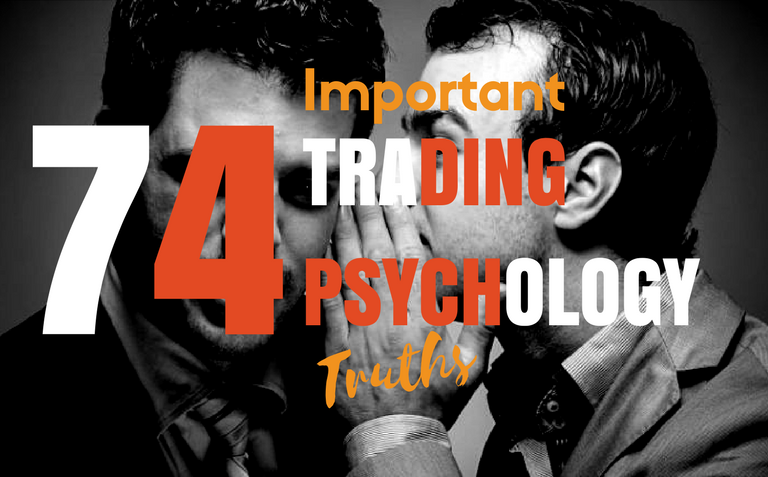 That said, in this week’s post, I want to share 74 trading psychology truths that will hopefully make you understand just how important your mental edge is and why working on it should be one of your top priorities. 1. Beginner’s luck often stifles growth. Losses and failure are good for you. 2. When failure smiles at you, the best thing you can do is smile back, while acknowledging that the lessons that stick are those that hurt. 3. Learn to laugh at the little things and this whole trading thing will be a whole lot easier. Be amused by your mistakes and failures and be thankful for the lessons. Trading is not strictly business, it can be mixed with pleasure. 4. Mistakes are essential stepping stones. Don’t shy away from them. Instead, welcome them. Let them teach you. Keep trading and keep pushing. Virtually every tale of success in trading that you’ll read involves resilience in the midst of failure. 5. Trading is a process. Be patient with yourself. At first, you will make mistakes; you will fail. But you want to fail. You need to fail. Failure is good for you. It builds resilience of mind; develops wisdom; it is the foundation upon which mastery, success, and happiness rest upon. 6. In order to succeed, you first have to be willing to experience failure. Truly willing. No lip service. That’s the price to pay. 7. One of the biggest difference between a winning trader and a losing trader is gratitude. when you allow gratitude to flow in your life, failures and mistakes don’t have the same meaning. 8. The moment you begin to entertain an expectation of obtaining something from what you’re currently doing, you’re instantly taken out of the experience of the present moment and you start operating with a loss aversion bias, which leads to rigidity and inflexibility. 9. When your expectations are low, it’s very hard to fail. 11. If winning trades give you a buzz, you’re conditioning your mind to drool in anticipation of its next fix. And when it doesn’t happen, it’ll upset your expectations. If thrill naturally arises (which it will), feel it as it is, but then don’t cling to it. 12. The paradox in trading is that you need a good reason to get started — to invest time and energy in it — but once you start, you need to let go of expectations. 13. The market will always supply unexpected changes. Flow; don’t resist. 14. Instead of setting unrealistic expectations, resolve to simply be patient and consistent. 15. Don’t demand or expect that the market unfolds as you would wish it to. Follow your process and accept reality as it actually happens. That way peace is possible. 16. In trading, things frequently won’t turn out as you expect them to. And how you deal with this is really what will make or break you. 17. You need to further your clarity by developing a deep understanding of probabilities, instead of feeding your delusions and grandiose expectations. 18. If you intimately expect to have a winning trade everytime you place a trade, you’re preparing yourself to head on an emotional roller coaster ride. 19. Don’t take trading too seriously. Nothing ever happens the way we expect. 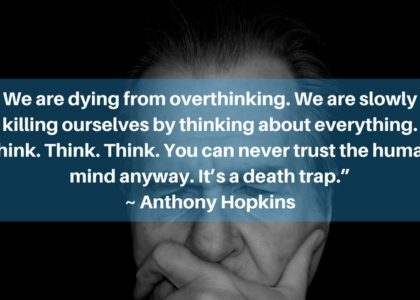 Overthinking is a waste of time & energy. Just stick to a process. 20. Failure is just a matter of perception. 21. It is your own mind, not the market, or life, that is to blame for your failures. You, yourself, are responsible for the good and bad in your life. 22. Even the worst loss that ever happened to you can be seen and converted into something positive. Life is all perspective in the end. You have the choice. 23. It’s the worry that gets you, not the actual loss. 24. From the market’s perspective, every up or downtick is just information. You are the one interpreting that information based on your beliefs. 25. A good trader trades rules unconditionally. Money is just a by-product of doing that well. 26. Being positive doesn’t mean that you have to be overly happy, cheerful, and optimistic. It means that you cultivate perspective and allow wisdom to guide your life. 27. Your mental and physical health comes first. Everything else is secondary. 28. It all starts and ends in the mind. The most crucial skill is how you think. 29. Happiness isn’t about reaching a state of constant high. It’s about being content with what you are and have. 30. If you always look to learn from everything, you will generally do so. 31. In trading, often what a person needs is not some brilliant mathematically-oriented mind, but just a little bit of common sense, patience, humility, and discernment. 32. Patience, persistence, and practice— your three best friends. Don’t ditch them. 33. Focus, patience, wise discernment, non-attachment —the skills you acquire and cultivate in meditation and the skills you need to thrive in trading are one and the same. 34. Part of being a good trader is knowing how to go through drawdowns with grace, courage, patience, and vision. 35. Impatience shows a lack of control over yourself. 36. The two greatest mental skills of the Pro-trader are patience and non-attachment. 37. In trading, patience is not just a virtue. It’s gold. Sometimes you can accomplish the most by doing nothing. 38. Trading is mostly a waiting game. if you want action that happens on your own terms, you’re in the wrong field. 39. Patience/ resilience/ non-delusion WILL be rewarded by the markets. 40. Trading is a path of losses. If you know what you’re doing, you’ll make sure to reap small losses. But sometimes unfortunate events will cause you to take bigger losses. If you’re any good enough at this game, you’ll make money in spite of that. 41. At its core, it is not losses that make you suffer. What makes you suffer is some idea or belief that you’re holding too tightly. 42. A person who hasn’t made peace with his past losses is likely to accept future gambles that would be unacceptable to him otherwise. 44. Stop trying to avoid losses. You can’t! Instead make sure they don’t get out of hand. And then maximize your profits. 45. Don’t resist losses; Embrace them and know them to be small turbulences on your way to your destination. 46. Profits and losses come and goe in a probabilistic manner. Which means you don’t know for sure what will show up next. Accept this. 47. Win, loss whatever emerges in the short-term, place and manage your next trades untouched, unattached… always keeping your eyes on the long-term picture. 48. When you learn to let go of the need to be right, being wrong gradually loses its power to disturb you. 49. Over time, the greatest risk you can take is to take no risks at all. 50. Everything about life is a matter of probabilities. Don’t aim to be right. Aim to be less wrong. 51. The hallmark of a good strategist is the capacity to manage risk in the short term while keeping his eyes on the long term. 52. Fear will make you overestimate risk. Greed will make you underestimate risk. Equanimity will make you see things as they are. 53. Managing your risk is crucial. But too much conservatism in your trading will narrow your trade selection, tether you to what’s comfortable, and lessen potential rewards. 54. 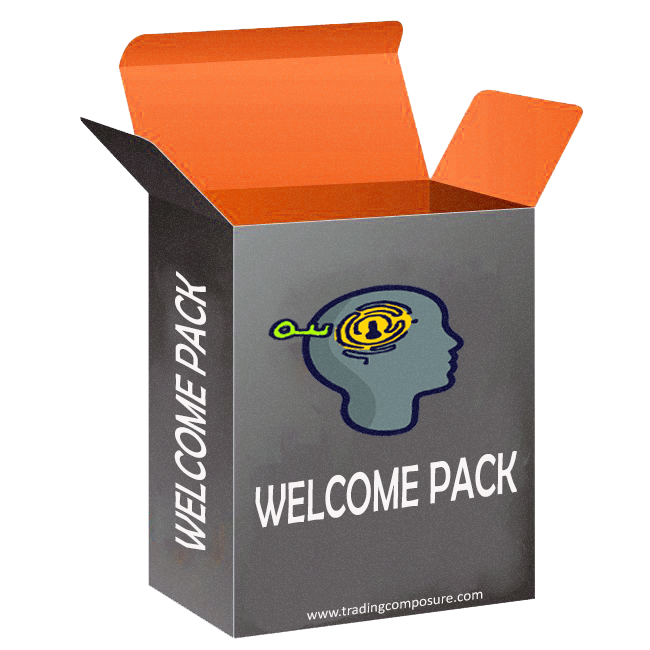 New traders enter the trading arena focusing solely on the possibility for huge profits. Pro traders understand that trading carry some significant risks and instead they focus on managing that. 55. Desperate traders will often risk a lot just to get even. 56. Always take calculated risks in the markets/ in life. 57. The function of risk management is not only to protect your capital; it’s also to preserve your emotional well-being. 58. The beauty of mastery lies in the ability to trade beyond your sense of self. In other words, there’s no You involved. There’s just execution. 59. Mastery is effortlessness. You’re not fighting or trying hard. In some cases, you’re not even thinking. You’ve just allowing yourself to be, and by doing so, you’re letting intuitive experience come to the surface and guide you. 61. Trading mastery is a state of complete acceptance of probability, not a state of fight it. 62. Trading mastery begins when you’ve developed the confidence to face your trade opportunities, your losses, your failures, your successes, your fears, your discomforts, rather than running away from them. 63. On this path to trading mastery, use losses as a way to measure your progress —i.e, how mentally stable are you? If losses still trigger intense feelings of anger, confusion, despair, or even betrayal, you still have some personal work to do. 64. Trading mastery doesn’t mean being emotionless. It’s realizing that the inconsistencies are all in your mind. And it’s the stories you choose not to believe anymore. 65. The way to trading mastery is not in the myriads of systems. The way is in the mind. 66. Either you control your desires or your desires control you. Choose wisely and be firm with yourself. 67. Much of what we attribute to chance is just stubborn persistence. 68. Knowing what to do is very different from doing what you have to do. 70. Growth is what keeps life interesting, and it comes from doing hard stuff. 71. Starting out, strategy matters more. Over time, psychology is the difference. 72. There is a way to experience difficult emotions as something other than pain and suffering. 73. Gratitude shouldn’t just be a reminder. It should be a default mental state. 74. If you worship money, possessions, or prestige, you’ll never have enough. Hi Yvan, such a great article! Thank you!